The ghost of Christmas past returned to haunt the Clarets as a 2-1 defeat against Spurs at White Hart Lane pulled them back in to the bottom three. Results were going in favour of the Clarets at the interval, but Charlie Austin netted a hat-trick as QPR fought back from two goals down to beat West Brom at Loftus Road. After a 1-0 win over Southampton, the Clarets started brightly as Kieran Trippier’s pressure on Ben Davies devloped an opportunity to cross but Scott Arfield missed the target at the back post. Spurs responded down the same flank with Nacer Chadli and Christian Eriksen working the ball infield though Ryan Mason could only poke wide from the edge of the box. Danish international Eriksen claimed three assists as Spurs bypassed Newcastle in the quarter-final of the Capital One Cup midweek, but with Burnley’s early resilience causing frustration he was forced in to firing from distance where he was denied by Tom Heaton at the foot of his post. Soon after, with options once again at a premium, the in-form Harry Kane wastefully found the stands. That sequence continued as the 20-minute mark approached; Mason scooping over from Erik Lamela’s short set-piece from the angle of the penalty area. There seemed little substance to the home side’s threat, but that all changed on the first instance that they breached enemy lines. Sean Dyche’s side have out-run the opposition in the majority of Premier League games this term, but Mauricio Pochettino’s outfit demonstrated the art of running from deep as the breakthrough arrived. Michael Keane was harshly adjudged to have handled in the build up, Kane restarted play instantly and the striker darted in to the box, ghosting between Keane and Ben Mee, to get on the end of Chadli’s centre. Dyche, however, was unamused. 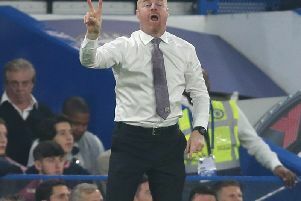 The Clarets boss ran to the fourth official in disbelief claiming that Eriksen - who let Kane’s pass run when standing in an offside position - showed enough interest in the free-kick to be interfering with play. Referee Mike Jones thought otherwise. After Heaton denied Lamela, the Clarets got back on level terms in exquisite style. Ashley Barnes was the man with the finish, edging between Kyle Walker and Fazio and fashioning a sublime effort past Hugo Lloris and in to the top corner. The hosts should have restored the lead on the half hour, instead Kane was left red-faced and staring in to the sky with a puzzled expression as he miscued from Lamela’s pull back from inside the six-yard box with the goal gaping. Eriksen then blazed over as the ball rolled in to his path at the back post. However, another moment of individual brilliance saw Spurs creep back in front. Kane and Mason worked the ball from left to right and Lamela, whose sharp turn of speed carved a route beyond Mee, shaped a delightful effort in to Heaton’s far corner to register his first Premier League goal. Spurs continued to find success from deep; this time it was Mason that spotted the clearing but the midfielder lifted over from Eriksen’s incisive pass. Mason subsequently limped off injured following pressure from Jason Shackell and was replaced by by Benjamin Stambouli. As the half closed Kane’s remarkable effort dipped just wide of the far upright, Stambouli drilled over while Dean Marney side-footed wide from Danny Ings’s squared pass. Frenchman Lloris proved the star of the second half, thwarting Ings on numerous occasions before saving from substitute Ross Wallace’s free-kick late on. The goalkeeper turned around his near post after the England Under 21 international raced past Fazio from Barnes’s threaded pass. And Lloris saved again when the resulting corner fell to the feet of Ings, though the Spurs stopper was expected to save from an awkward angle. Ings replicated his run and effort later in the half, bursting past his marker once more, but yet again he found Lloris in fine form at his near post. The linesman’s flag denied Chadli in the 64th minute as the winger stepped on to Kane’s pass too soon, before Eriksen’s cross flashed across the face of goal and by the out-stretched boot of Kane. Dyche had thrown Wallace, Michael Kightly and striker Lukas Jutkiewicz in to the fray as he looked to salvage something from the fixture but he was to be denied anything when Lloris got down superbly to palm Wallace’s free-kick to safety.